To add a unique touch to your special occasion. Silver Thistle can provide anything from a soloist to the full band, depending on your needs. Kenneth was amazingly talented and professional. 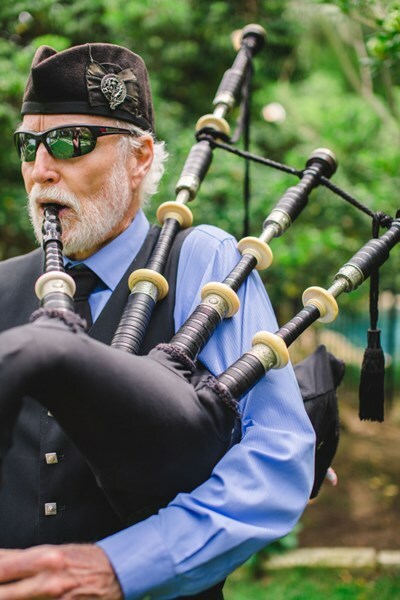 He even did a special request of “Sweet Child O’ Mine” on the bagpipes for us. Ken came to play at my mom's 80th birthday party. He was fantastic and my family and friends really enjoyed talking to him and listening to him play the bagpipe - in the rain!!! He made my mom' s birthday extra special - I never seen so many young kids and adults taking video of him. It was a delight to have him part of the celebration. I highly recommend him. We hired Ken Liechti to play our private party to celebrate the end of summer and his beautiful piping was the highlight of the evening. Mr Liechti was very friendly and professional in all correspondence and his performance was of the highest quality. Thoroughly enjoyed hearing him play and would recommend to anyone in need of a first rate piper. Please note Kenneth Liechti will also travel to Manchaca, Del Valle, Buda, Kyle, Cedar Creek, Dale, Manor, Mc Neil, Pflugerville, Driftwood, Lockhart, Maxwell, Round Rock, Cedar Park, Elgin, Red Rock, San Marcos, Spicewood, Leander, Bastrop, Dripping Springs, Wimberley, Martindale, Coupland, Staples, Fentress, Hutto, Mc Dade, Prairie Lea, Rosanky.